Plot of data acquired during CODAC real-time control of KSTAR two weeks ago in Daejeon, South Korea. Two weeks ago, ITER CODAC technologies (Control, Data Access and Communication) successfully demonstrated their capability for Tokamak control at KSTAR (Korea Superconducting Tokamak Advanced Research), a tokamak in operation since 2008 in Daejeon, South Korea. The KSTAR and ITER control systems share some key similarities (e.g., EPICS as middleware for tokamak control and operation), making KSTAR a natural fit for evaluating and validating ITER CODAC technologies. Operating under a Memorandum of Understanding between ITER and KSTAR, signed in 2010, the KSTAR control team has implemented a duplication of the fuel control system and a part of the plasma control system using CODAC technologies (standardized hardware and CODAC Core System) over the past 24 months. 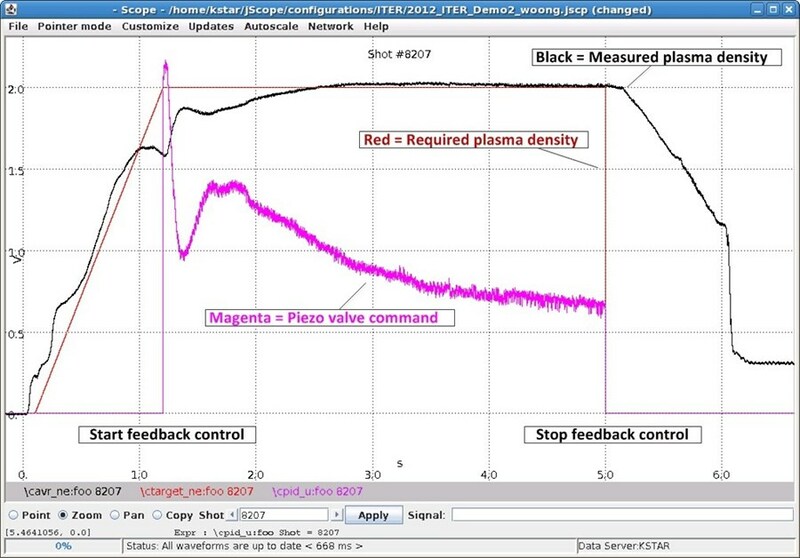 On 26 July, a first test was successfully executed by injecting deuterium gas into the vacuum vessel based on pre-configured waveforms from the plasma control system. 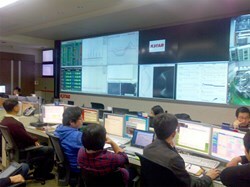 The KSTAR control room during the plasma density feedback operation. The project was successfully concluded on 21 November with a demonstration of the real-time feedback control of the KSTAR plasma density, with ITER Organization CODAC staff joining the demonstration. The algorithm used for calculating the density from the microwave interferometer diagnostic (sampled at 10 kHz) and computing the control command was implemented on a computer using ATCA form factor, the CODAC standard real-time operating system (RedHat Linux with MRG-R) and the MARTe real-time framework originally developed at JET. The control demand was transferred over CODAC real-time network (10 Gbps Ethernet) to the fuel controller at 10 kHz and finally applied to the piezo control valve at 10 kHz. 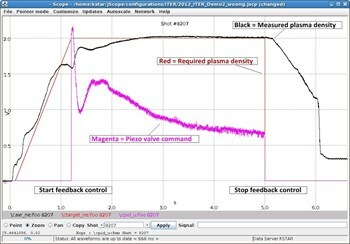 The plot shows the key measured signal and applied commands, such as required plasma density, piezo valve command and the resulting measured plasma density. The feedback loop was switched on at 1.2 sec and switched off at 5.0 sec. The resulting performance is in excellent agreement with KSTAR native control system, confirming that the technologies adopted or being considered for ITER CODAC are delivering excellent performance in the real-life environment of an operational tokamak.